19 Sep 2018, 10:28 a.m.
‘Gasping, dying – but somehow still alive …’. This excerpt, borrowed from the British band The Smiths’ 1985 song ‘Well I Wonder’, may well resonate throughout Paul Dobraszczyk’s book, for whom the ‘Dead City’ is not that dead. This work aims to build bridges between discourses in which ruins are perceived as objects of desire, and condemnatory visions that consider such romanticisation counterproductive for ignoring the political and socio-economic meanings behind abandonment. Building on the thought that modern ruins are usually seen as the antithesis to the expected promises of neoliberal progress, the author states that the way in which we imagine urban ruination ‘impacts upon how we approach and plan for it in real life’ (p. 1). Conveniently repeated and stressed, this is the main argument of the book and is indeed a major contribution if we consider that, since the academic ruin lust started to emerge a decade ago, scholars have attempted to find the practical utility derived from our increasing fascination with ruins. Dobraszczyk’s introductory chapter is one of the most complete reviews in terms of literatures and debates regarding ruin imagery/imaginary. The rest of the book unfolds with a series of case studies that the author divides into three different sections: ‘Histories’ (London, Manchester), ‘Explorations’ (Varosha, Chernobyl) and ‘Futures’ (Detroit, several unfinished geographies). In my opinion, these divisions are not as rigid as they may seem, and the fact that themes are actually intermingled can only be understood as the demonstration of ruin studies’ rich complexity. Be that as it may, what stands out clearly is the author’s focus on the renewed, fetishising perspective towards ruin aesthetics – something that, being controversial, should ultimately serve as an ignition to future re-appropriations. It is true that, in this book, most of said re-appropriations remain in a brief, desirable and speculative sphere, but, far from seeing this as a limitation, it must be interpreted as an invitation to act in our cities (as demonstrated in the chapter dedicated to the artistic operations in Detroit). For many of us ruin-researchers, the experience of being there and its subsequent representation has commonly been a first step to tackling deeper enquiries on ruination. At the core of this investigation there lies the role of urban exploration, which Dobraszczyk liberates from its often denigrated heroic constraints and superficial aura to intentionally place it as a valid research method with the potential to be sufficiently analytical and ‘more inclusive’ (p. 15). This is something that I have myself examined to the extent of categorising urban explorers in two different types. First, ‘performative’ explorers are those who prioritise the practice’s adrenaline rush over the historical relevance of the sites they trespass, but without a doubt Dobraszczyk is a ‘communicative’ explorer because his thoughts and findings are essential to mediating the story behind a place beyond embodiment and visualisation (Arboleda, 2016). What’s more, urban exploration serves him well to interact with local individuals and communities, reaching a broader humanising, ethnographical scope than that provided by subjectivity alone. Consequently, the recounting of his experiences results in a descriptive, direct and fluid narrative style, where the reader is entertained and mentally transported. The relevance of urban ruins within contemporary visual culture is another key aspect from the beginning to the end of this book and, here, the author particularly turns the gaze to how cinema has long been imagining ruined cities. For Dobraszczyk, reflections on filmographic references are a constant (almost a methodology in itself), but these are perhaps most present in Chapter 1, where London is portrayed in different ways of being eventually ruined: empty, destroyed and submerged. Different stages of ruination are also pointed out in Manchester’s abandoned cotton mills, including erasure for the sake of regeneration. Heritage is traditionally based on singularity, and thus the vast quantity of these sites in Manchester is an apparent obstacle to their public appreciation. Selective loss is fruitful and necessary (Holtorf, 2015); however, from the author’s mourning tone, one can tell that the tragedy takes form so far as the new does not seem to be better than the old. Dobraszczyk unveils one of the hidden treasures of Western ruined landscapes, that of the ghost town of Varosha in Northern Cyprus. His brief and risky exploration does not undermine the depth of his reflections in place, demonstrating a sense of compassion and empathy emerging from the sublime, where feeling ruins is anything but trivial. Overcoming a supposed lack of communal engagement, he convincingly argues that his solitary experience is ‘qualitatively different and valuable in its own right’ (p. 109). Just like Varosha, Chernobyl is defined as a transitional site, one where history is yet to be written, and Dobraszczyk wonders who must be in charge of writing it. Interestingly, the author shows that the aesthetic appeal of the nuclear accident’s epicentre is not entirely at odds with the victims’ memories, and thus, considering Chernobyl’s global popularity, the site broadens its heritage character in which ‘we all have a stake in how it is to be remembered’ (p. 122). The case of Detroit clearly shows the subsequent creative re-appropriation that ruins are subject to when there are no formal plans to redevelop. Dobraszczyk visits and reviews a series of graffiti, sculptures and installations that have been occasionally contested for being detached from the city’s critical background. Functioning like ‘processes rather than products’ (p. 153), the future of these artworks is as uncertain as the future of the abandoned sites where they are encountered. As defined by the author, architectural futures can also be ‘suspended’, and this is more than evident when it comes to unfinished buildings, a new typology of ruination to which I have myself dedicated the last four years of research work (Arboleda, 2017). After studying incompletion in Spain, the UK and Italy, Dobraszczyk succeeds in picturing a portrait of a phenomenon that, visually speaking, looks both ancient and contemporary, whilst demonstrating that the realisation of urban space is a dream that can vanish at any time. I wish I had more space in this review to delve into the specificities of the aforementioned cases, which the author has cleverly subdivided into different layers of knowledge within every chapter. Based on the enriching narrative power of ruins, each of these chapters begins with the history of the places in question, and finishes with constructive recommendations on how to repurpose them. Since the sites studied in this book have long been characterised by ruination, the most interesting feature in Dobraszczyk’s thought is his emphasis on incorporating architectural decay – as a representative, cultural value – into any envisaged project. Only through this will the past potentially resonate into the future, affording our cities to heal their wounds while negotiating identities – a process that will surely require accepting (and subsequently overcoming) failures, placing ourselves as a better society when mirrored in the humility of modern ruins. 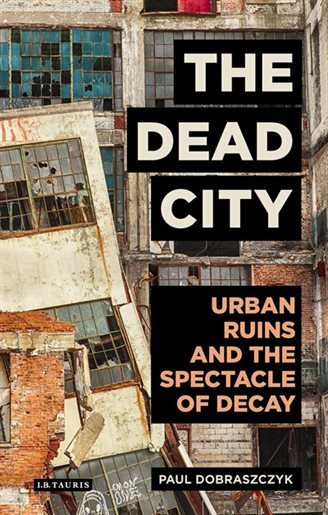 Hence, this book makes a great contribution to urban studies since it should be read as an actual push towards the inevitable tendency within ruin scholarship: to focus on existing practices where abandoned buildings are being re-appropriated while respecting their condition as ruins. This is a challenge that, just recently, DeSilvey (2017)and Sandler (2016) have started to explore, and it will allow us to materialise the poetics of ruins acquired in previous years. The book has certain limitations, but it is worth mentioning that Dobraszczyk has been wise enough to note them himself, especially when he admits that this is a Western-orientated contribution, and that ruin theory is still lacking further attention from the Global South. Similarly, he notes his role as an outsider, claiming for locals’ empowerment to build up their own stake. I would add that a wider interdisciplinary scope is missing, where voices from heritage studies and contemporary archaeology may well have supplemented the author’s discourse. Since the book is committed to ruin imagery, it would have benefited from higher-quality coloured pictures. Also, the chosen referencing style where endnotes and bibliography are indistinctively mixed makes the reading at times a little less fluid than it could be. Be that as it may, this book is compellingly rounded, and it will be of great interest to those who love ruins because we think they are one of the few spaces of hope in the on-going neoliberalisation of our cities. Yet if the city is dead, then long live the city! This book review appears in Volume 55 Issue 13, October 2018 of Urban Studies Journal.